The fastest way to become fluent in Japanese is to learn the basic sentence patterns. 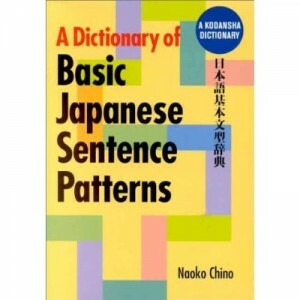 Basic Japanese Sentence Patterns by Naoko Chino is a Kodansha dictionary covering the 50 most common sentence patterns in Japanese. Each pattern is explained clearly and concisely, and plenty of examples are given. Variations on each Japanese sentence pattern are explored. Basic Japanese Sentence Patterns is divided into two parts. The first part contains 17 patterns for noun and adjective sentences. Part two covers 34 patterns for verb sentences. A verb conjugation chart, an adjective inflection chart and an index make Basic Japanese Sentence Patterns a valuable reference book, as well as a great Japanese textbook. If you are teaching Japanese, Basic Japanese Sentence Patterns could be used as a core syllabus. The price is $22.00 but you can get it from Amazon for just $14.74, saving you 33%($7.26)!